On March 29, 1974, the Terra Cotta Warriors were discovered in Xian, China. A terra-cotta army of more than 8,000 life-size soldiers guarded the burial site of China's first emperor, Qin Shi Huang Di. The Terra-Cotta Warriors were only discovered in 1974. 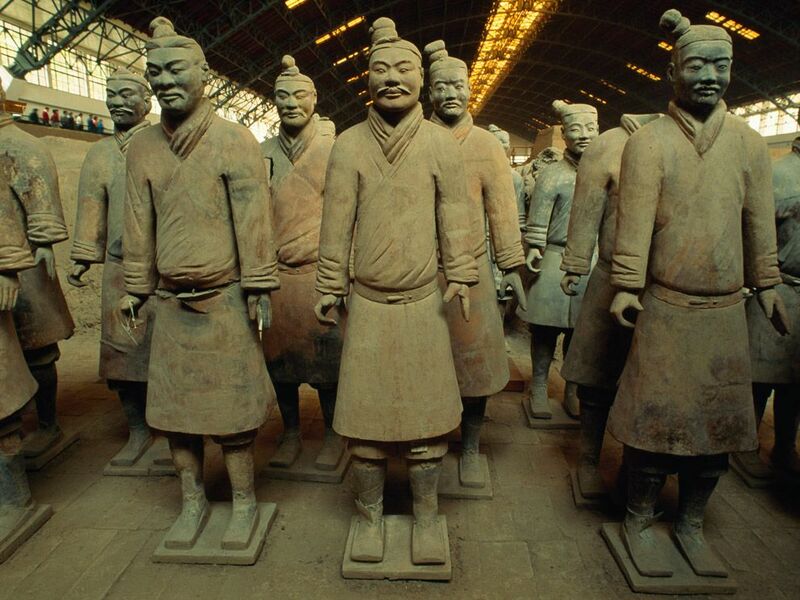 On March 29, 1974, the Terra Cotta Warriors were discovered in Xian, China. Local farmers came across pieces of a clay figure, and these shards led to the discovery of an ancient tomb, vast in its size and number of artifacts. The tomb belonged to Qin Shi Huangdi, the first emperor of China. In the large and elaborate tomb, more than 1,000 sculptures of horses and warriors in full armor were found standing in battle formation. Most warriors stand more than 2 meters (6 feet) tall and weigh about 272 kilograms (600 pounds). Each warrior has unique characteristics—facial features, hairstyles, clothing, or pose. All excavated warriors remain in battle position and are on display in their original setting. (259-210 BCE) first emperor of China. (~210 BCE) collection of thousands of life-size clay figures of soldiers, horses, chariots, and other artifacts in Xian, China, buried with Qin Shi Huangdi, China's first emperor.